Caramel Wings: Celebrating The New Domain with Mangoes, Mint, Custard and French Tart Dough. 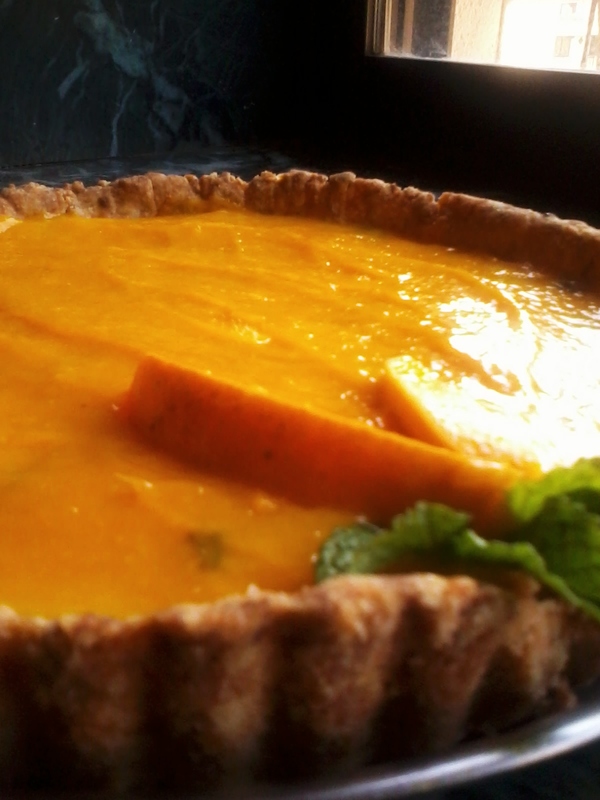 Celebrating The New Domain with Mangoes, Mint, Custard and French Tart Dough. So let me start with the good news. I won this super awesome contest from a super awesome page on twitter called @OnSkies. You guys should totally check out their facebook page and twitter page. Basically I had to tell them why should they domain my blog, and the prize up for grabs was a free domain name! And I won!! *does the happy dance* And so this morning Caramel Wings got a new domain, www.caramelwings.in and that definitely calls for a celebration. This recipe was born out of sheer inquisitiveness. And then I fell in love. With David Lebovitz. And his awesome awesome post giving out the recipe for the French Tart Dough. And I am not going to type out the recipe for that just because it is so clearly explained on his website, which I will link you guys to! This Tart Base uses hot and brown butter (Beurre noisette) and the dough is actually hot when you set it on your tart pan. I was actually nervous and scared coz the recipe called for the butter with other things to be put into the oven for a good 15 minutes at 210C/420F. I thought to myself, "this is ridiculous, it would all burn up if I don't keep checking on it after two minutes". But I was wrong, and how. The Butter was browned slightly from the edges, and ended up giving the tart base a lovely nutty taste, and I think I am now addicted to Beurre noisette. Like my fellow food blogger Emma says on her blog,Beurre noisette is a way of life. I now agree with her. 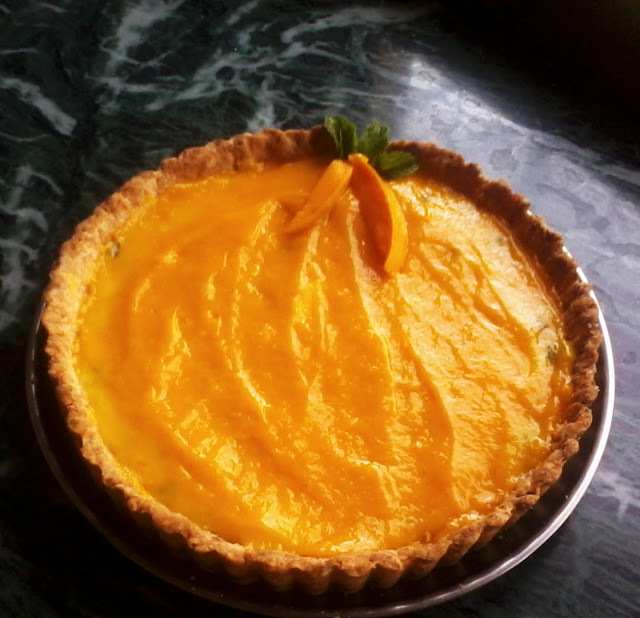 As for the filling, I knew I had to do something with Mango and Mint. I thought of slicing up Mangoes and arranging them on the base with some Mint, but then thought of making a Mint Pastry Cream instead. It all worked out beautifully. Much like a party in your mouth. Here is the recipe! Mango and Mint Custard French Tart. A handful of chopped Mint leaves. Some Mango segments and Mint leaves for decoration. Mix the Sugar, Flour, Salt, and Egg Yolks in a bowl. On a small pan heat up the milk until you start seeing fumes on top. Not boiling. Put in a tablespoon or two of the milk in the egg yolk mixture and whisk. Then add in all the milk to the mixture and whisk thoroughly. Put this mixture back on the pan and heat it up on medium, whisking continuously. You will see that the mixture starts off as runny but thickens up quite a bit as it cooks. Once it is of a creamy consistency, turn off the gas and strain it into a bowl. Add the Vanilla essence, mix, cover with plastic wrap or butter/parchment paper and let it chill in the refrigerator. You can mix in the chopped mint leaves at this stage or after it is chilled! Recipe as above. 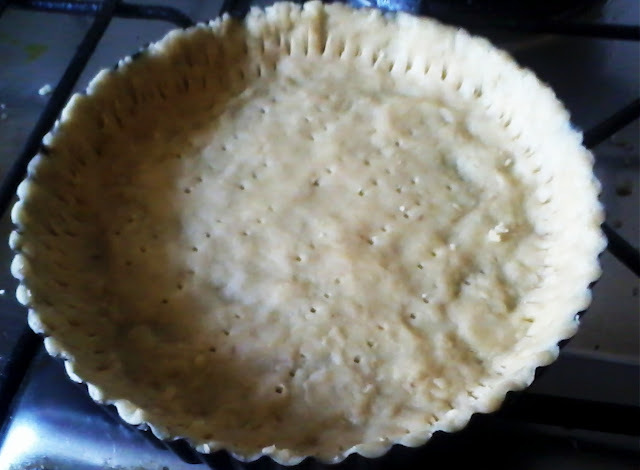 I actually ended up making a pretty thin base for my tart in excitement and the result was yummy but a little too crumbly. So I would suggest you either roll it out before you put it on the Tart pan or just take care while sticking it to the pan that it does not get too thin. Let the Tart shell cool down a bit. 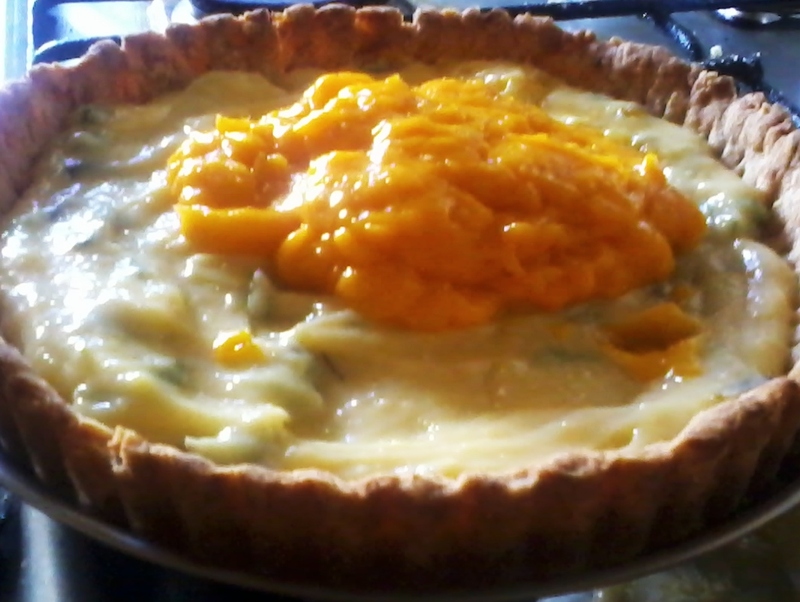 Pour the Mint custard on the Prepared and baked Tart Shell. Spread it well. 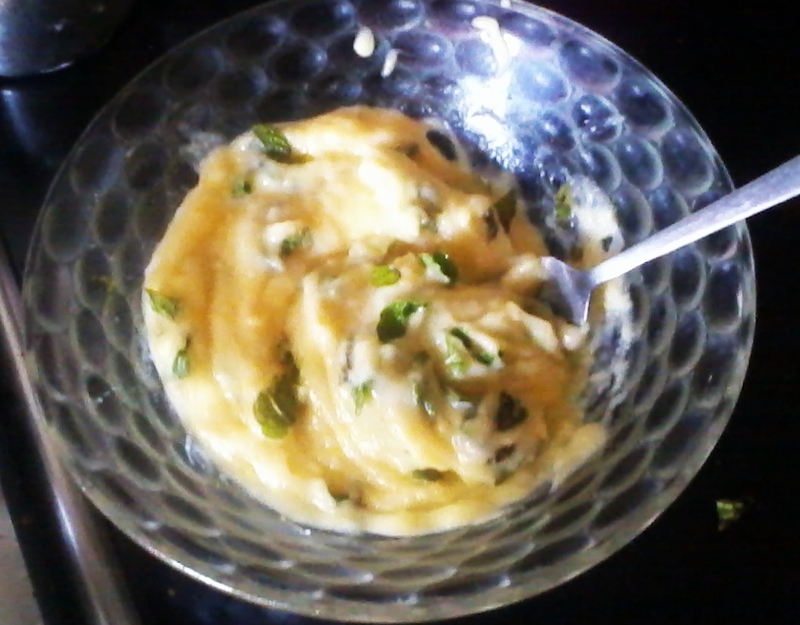 Then add the Mango Puree and spread that well too! Nice tart. 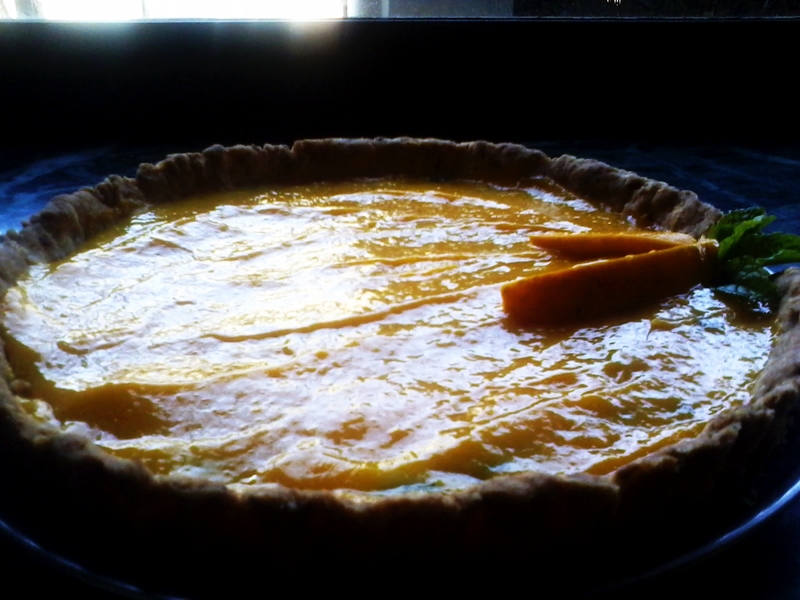 David's tart recipe is a winner and very addictive :D. Your mint pastry cream looks good too.